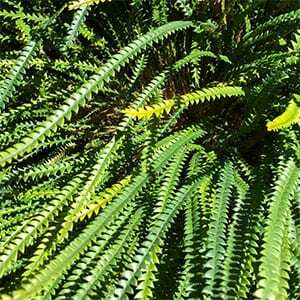 Foliage plants are a great addition to any garden and Banksia Nivea is certainly one to consider. This is a low growing shrub grown more for the attractive weeping foliage than the flowers. Commonly called the Couch Honeypot, the flowers are small and a golden yellow, they are attractive however they do form down in the foliage. The flowers will attract nectar seeking birds as well as bees to the garden. Plant it near the edge of a path or grass area where the texture of the foliage can be appreciated and the flowers as they appear can be more readily seen. If plated in a sunny position and a well drained soil, this is a an easy care plant. It will spread to over a metre across yet can be lightly pruned after flowering to help maintain shape and size. During long dry periods in summer, some additional water will be beneficial. Flowers – Orange to red hidden in foliage. Foliage – Mid to deep green, toothed and with a weeping habit.